Good morning! I feel like it's been a while since I've been here. Our weather in St Louis has been so beautiful lately that I have used every waking hour to get out of the house or prepare my home for the coming spring. As I've posted on Instagram, the kids and I did some running around this week, picking up some colorful new kitchen gadgets and I've been wearing big hair and cotton dresses. My new swimsuit from Walmart came in the mail yesterday and I'm all excited to set up our little back yard pool and take the kids to play in the river in a few months. Spring is always a time of great change for me. As I have previously blogged about, seasonal depression has me down from November to February so by the time March arrives, my notebook is bursting with ideas and to-dos. One to-do that has been on my list for a while is to mix it up a bit with my sponsored blog posts. In my new monthly "Shop Talk" post, starting tomorrow, we will check out my wonderful blog sponsors, talk about what's going on elsewhere and get some style inspiration for next month. I may add some slideshows, videos or mini e-zines throughout because I love visual pretties. Also, for those of you who have subscribed to my monthly newsletter, I skipped both Jan and Feb newsletters because life was so crazy around here but they will resume again in March so keep an eye on your inbox for that! I have some very pretty spring hat patterns to share with you. The blog will be getting a pretty new design in the next month as well and I'll be organizing and labeling everything a little better. Blogs need spring cleaning too, right? I did too! It was pretty rough. Do you have a therapy light? I have two of them from Verilux and I swear they do help. I have one by the kitchen sink so I turn it on while I wash dishes. I also close all of the windows just before sunset and put up bright colored curtains to distract me from the shorter days. Silly but it makes a difference for me! I think I'll have to look into the therapy lights. I get really cold easily so being cold all the time doesn't help. And I also hate wearing a million layers. It makes me feel fat. :/ But hopefully it's almost over! I can't agree more with you regarding the seasonal blues from Nov-Feb!!! I suffer from the same thing and this winter in NYC with the "Polar Vortex" and the mounds of snow just made it worse. This was our first week of above freezing temps which brought a massive snow melt! Ed and I took the opportunity to go to the zoo today -- animals+sun+warm temperatures=a break in seasonal depression. I can't wait to see the new blog design! And yes, here's to a marvelous, beautiful spring! And here's to Victory Garden planning! WAHOO! 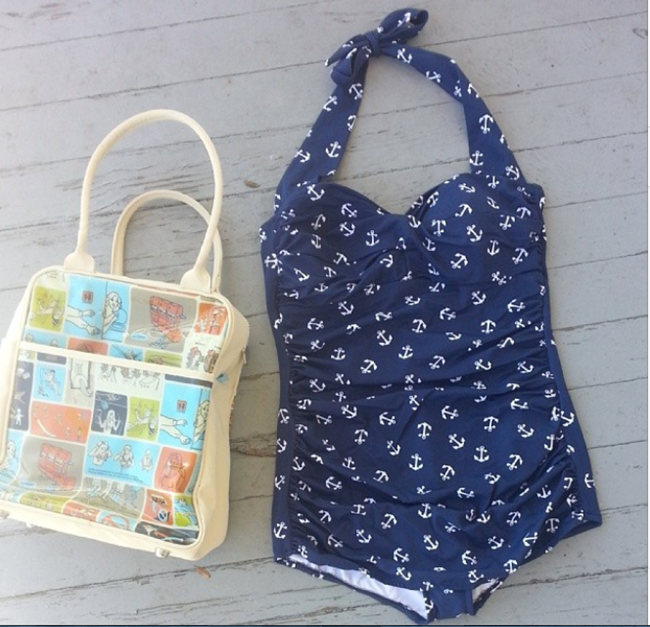 The bathing suit is great! Makes me wish I was living in the US. To order it and make them ship it to Europe will make it an expensive bathing suit eventually. Pity! I can't wait so see your blog spring cleaning :-) ! I'm ready for summer for sure! I've followed your blog for quite some time and enjoyed "Hey doll", but with school starting and teachers always go back early, I missed something. Is the magazine somewhere else? Oooh, how thoroughly exciting that a blog revamping is in the works! Last months (long overdue) design changes on my site have been one of the highlights, and best happiness inducing, elements of this year so far. I hope the same rings true for you, too, honey. I was wondering where the newsletters were! I miss them. Always enjoy your blog and so glad you are getting back in the swing of things! Cute pics! You are so beautiful and I love those glasses. I am very jealous of your lovely weather. It snowed here today.